The import tariffs on steel and aluminum that US President Donald Trump has promised to adopt next week are part of the group of protectionist decisions and plans that characterize his administration. The Commerce Department concluded in February that the US aluminum and steel sectors, considered strategic, suffer from unfair foreign competition, which could reach national security by affecting the defense area. The Department has proposed that Trump penalize all imports of aluminum and steel, tax only those of some countries or impose quotas. On Thursday, Trump announced that import tariffs of up to 25% for steel and 10% for aluminum would be adopted next week, without specifying the countries that will be affected. 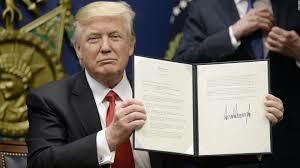 On January 23, 2017, three days after taking office as president, Trump withdrew the United States from the TPP free trade agreement that his predecessor Barack Obama had signed with 11 other countries in the Asia Pacific region. The treaty deliberately excludes China and would represent the largest free trade space in the world, but Trump considered it injurious to the United States and ordered the untying. In recent weeks, however, Trump seemed to downplay his radical opposition and said Washington could return in the event of better conditions. The 11 countries of the TPP, however, have decided to continue without Washington and next week they will sign a new version of the treaty in Santiago. Treasury Secretary Steven Mnuchin admitted he had "top-level" talks about the TPP. At the end of July, a revision of the United States' bilateral trade agreement with South Korea, signed in 2012, was announced that Trump called "very bad" because, in his opinion, it benefits the partner more. The renegotiations began in January. In 2017 South Korea was the sixth largest trading partner of the United States, behind Germany and ahead of Britain and France. Trump calls the North American Free Trade Agreement (NAFTA) with Mexico and Canada "greedy" since 1994 and called for a renegotiation. The Commerce Department has opened investigations into several products suspected of entering the United States through unfair trade practices. The list includes, among many products, South Korean washing machines, Chinese solar panels, Spanish olives, Canadian paper, Chinese aluminum foil and biodiesel from Argentina and Indonesia. From Trump's inauguration on January 20, 2017, through February 26, the Commerce Department opened 102 investigations into countervailing or anti-dumping duties, which means 92% more than in the previous period.